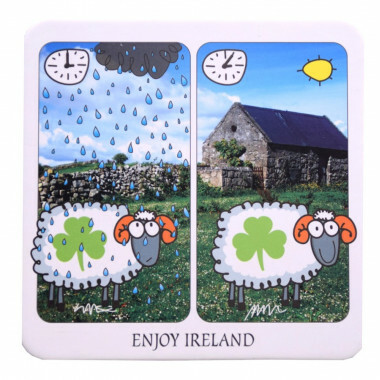 This "Enjoy Ireland" coaster features the beautiful Irish countryside and a shamrock sheep. In Ireland, the weather forecast is so impredictable and switches from rain to sun in less than a minute! This "Enjoy Ireland" coaster features the beautiful Irish countryside and a shamrock sheep. An Irish saying is featured on the reverse side of this coaster. Size : 9.5 x 9.5 cm.